On Sunday, I spent some time in the morning rearranging my furniture. This was a stupid idea. 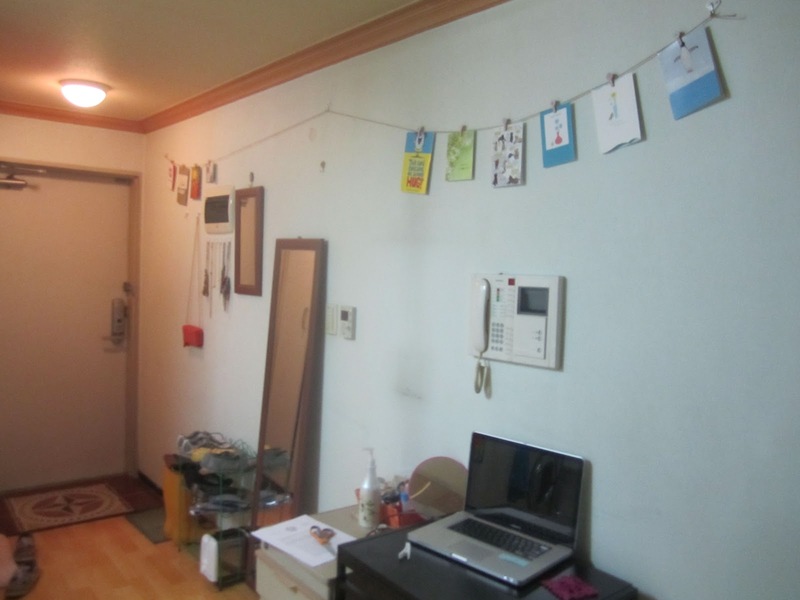 My studio-apartment has very few ways to organize a room; what with the kitchen taking up one wall, the wardrobe and water heater closet taking up another. Plus the window and entry way... But, regardless, I decided that I was sick of the hassle that making my bed caused Since my bed is up against a wall, I have to climb on the bed to try to make up the bed... If you are not picturing this in your head and laughing at my attempts to "jump and pull" the sheet straight, you should. I moved my bed into about 3 different positions. This should have been fairly simple, seeing as how I have faux-wood floors and the bed is not heavy. However, I have this massive tangle of cords that run under my bed (due to the placement of the outlets and the only corner my bed can go in), and that makes any movement of the bed frustrating, as I would have to move the bunch of cords. (Point of interest: I did attempt to detangle the cords and make some sense out of it, a la my father, but it just got tangled again...) Finally I just decided to leave it. Later that night, I told my mom about it, and we decided (aka mom suggested and I sat crying and agreed) that I was trying to control my furniture in an attempt to control my life better. With my paycheck still not going through, not knowing when I will see my boyfriend again, and various other unknowns (mostly to do with when I return to the states... in 10 months...), I was seriously struggling. I also went to church on Sunday between fits of OCD/CFD (control freak disorder... yes, I did just made that up). I decided to go to the coffee shop I love after service. However, what should have been an hour and a half turned into 6... I accompanied Casey to fellowship after the service, where I was asked to introduce myself in front of everyone. Good thing I am not terribly shy! After fellowship, I stuck around for Small Groups. I was in the group with Casey, and I definitely had some mixed feelings. I certainly enjoyed the material and being with other people, but the quality of conversation and energy of the group was taxing... some of the guys seemed like they would rather be anywhere but there. I ended up answering the majority of the questions, and was asked to do the end prayer. Woah, way to pick on the newbie! I just did it, and I believe it was a success, despite my slight fear of praying out loud with witnesses (ha!). After the small group, we were going to go to dinner with the other small group members (in other groups), so we waited for them... for about 45 minutes. Man, talk about frustrating! Plus I was starving... never a good combination for Chelsea (remember... "h-angry" aka "hangry"!). Luckily, Casey suggested Shabu Shabu (which was originally suggested by myself, in Casey's ear...). We had a cheap and delicious dinner. By that time I was exhausted, and picked up a latte on the way home from the cafe where earlier I had unfortunately not gotten a chance to relax in. By the time I went to bed that night (after crying about virtually nothing to both my mom and Michael), I forced myself to not rearrange the furniture yet again, and went to sleep. Monday came all too early! I went to check if my paycheck had gone through and it still had not. I was appalled and quite annoyed. I resorted to pulling out some cash from my American bank account, which I had been trying not to do recently. I picked up some bread and finished getting ready for work. Work was okay. We did "writing contest" last week, so I was tasked with marking my students' papers so they can do rewriting for homework. It was so boring, and I developed a new appreciation for English teachers in America that have to read actual essays (my kids wrote between 1 and 3 paragraphs, depending on age and skill level). Whew! I feel like I should talk about a situation I have already mentioned that developed further on Friday (late, I know...). Remember that class with the 3 girls (2SAP) where one girl told me the others said I was a bad teacher? Well... there's more to the story! On Friday when I walked into class, the two girls who had been absent literally ran to me and hugged my side and yelled "teacher! teacher!" They told me how much they missed me, how they scored on their exams at school, etc. It was so sweet, and I kept thinking how weird it was that they would say something negative about me. As class progressed, I started noticing how Charlotte (the tattler from Friday) was treating the other girls. She has always muttered in Korean under her breath when we are working or she is writing, but Friday I was informed by Rachel that what she was saying was a curse word. After a light reprimand, Kelly called me over to check her work. While I was checking, she whispered in my ear that not only was Charlotte saying a bad word, she was also saying how she was going to say mean things about Rachel and Kelly at her birthday party this weekend. Okay, that sealed the deal. Charlotte is officially bullying these girls. After further thought, I realized that even though my kids do not really speak my language they are still kids and they still know how to be manipulative. I have concluded, and I think I am right, that Charlotte told me that they said I was a "bad teacher" when the other girls were gone in order to pit me against them and get herself on my "good side" (which, for the record, I do not have in class). So, while I still believe my conclusion that it does not matter one bit what your kids say, that the same kids can also be as manipulative as a ventriloquist. 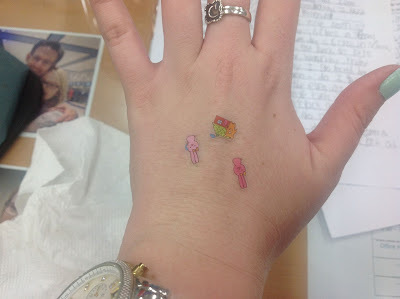 It was really nice to be told I was missed by some of my favorite kids. 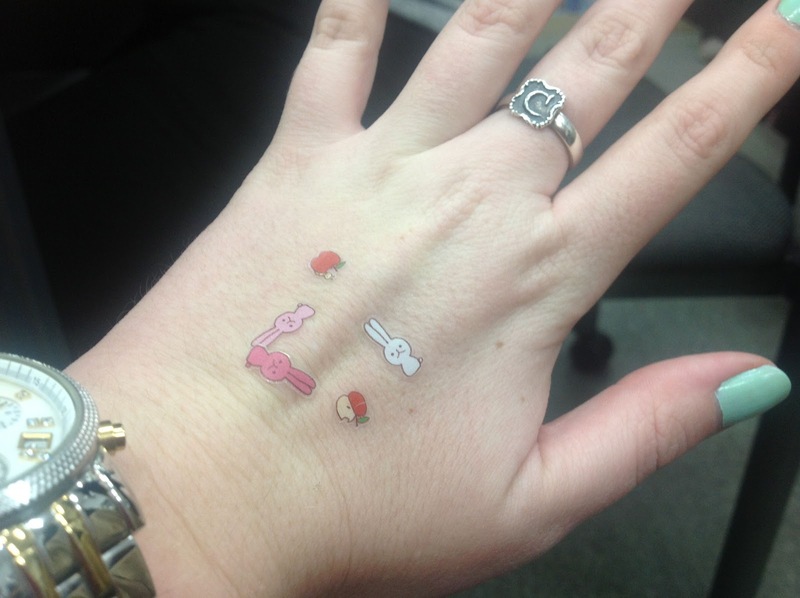 This week, Rachel even started giving me "hand candy" as I call it; stickers she just puts on the top of my hand while I check her homework. I proudly wear them the rest of the day (or until they come off). Apparently there are lots of rabbit stickers. After work on Monday I was sitting at my desk grading more writing contest papers when I notice Erin walk in with Jackie teacher. Wondering if Erin was okay, as meetings with your supervisor can sometimes be a bit stressful or upsetting, I asked if she was doing okay. She smiled and said "Yes, and I have some great news for you. You will be so excited!" Immediately, I walk to her side of the room. She smiled so big and said "Speech Contest is moved!" Speech Contest, if you don't recall, is an event that was going to keep me from being able to spend Saturday with my mom while she is here. I could not believe it!!!! I literally did a happy dance, complete with over the top and cheesy dance moves such as the Cabbage Patch (watch first 30 seconds) and Running Man. It is so ironic that this happened on Monday, when Sunday I had a lesson in controlling situations. I was fresh out from a weight of stress, deciding to just give it over to God and let Him handle my circumstances (a lesson which needs refreshing often for me). And here, the next day, He moved in some crazy way (like He always does), and I was blessed enough to get the weekend off to spend with my mom. Anyway, back to my day! I also learned that the 7-Eleven (take your pick of the 4 within a quarter mile of me) sells cooked rice that you heat in the microwave, and they have a microwave they let you use! So, rather than wait 45 minutes after I get home to have rice with a dish, I can pop over and heat up some 2 minute rice and have it ready immediately. This was great news for me! Today was a very productive day. I was able to finish all the writing contest papers, and even wrote one class's Report Card comments. Success! Plus, I just love Tuesdays and Thursdays because my classes are so much better! Speaking of classes, I have learned a good "trick" to getting the kids to stop speaking Korean in class (a big rule in the school). This is so obvious, I shouldn't even claim that I learned it but rather remembered it. I write everyone's name on the board, and if I hear you speak Korean, you get an X by your name. You can redeem yourself if you are good in class and participate. At the end of class, each X is 1 less stamp I will give in your stamp book. So far, it's working very well. Only drawback is that I'm kind of used to the Korean now, so I don't always hear it, which leads to a lot of tattle-telling. The cards hanging along my entry way and into my "bedroom." In other news, my furniture: I decided today to just return it to its original position, just moved out from the wall about 2"... Yeah, should have done that in the first place... 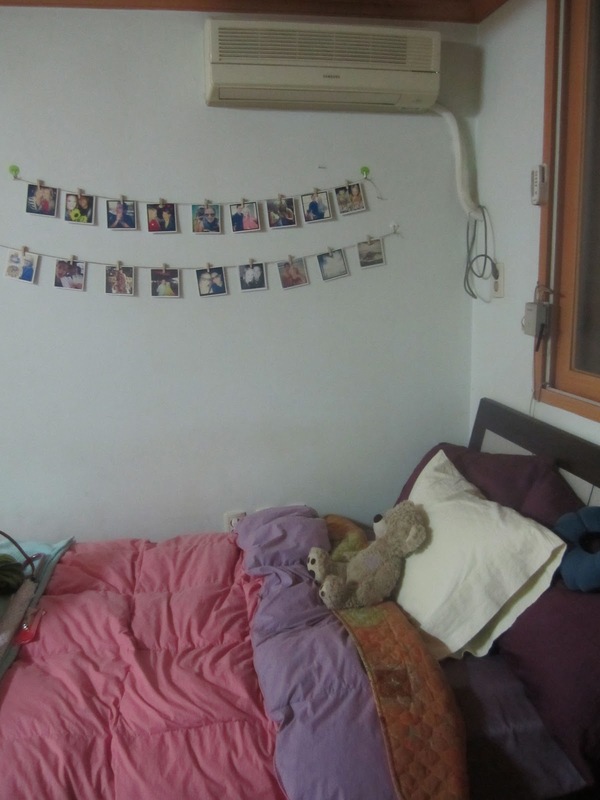 I also hung another row of Instagram photos by my bed, and hung some string to put my cards on. I don't exactly have room on my fridge for all of them, and they all mean so much to me. So, now they are also on display, similar to the photos by my bed. I know I won't have room for them all, by the time I leave. But, I have plenty more blank wall space for more rows, and plan to make good use of that! Two rows of photos for Winston (my bear) to look at! One last thing that happened today was that I received a gift from Michelle. She bought a cardigan/sweater that is super adorable, but finds that she doesn't have much to wear it with. 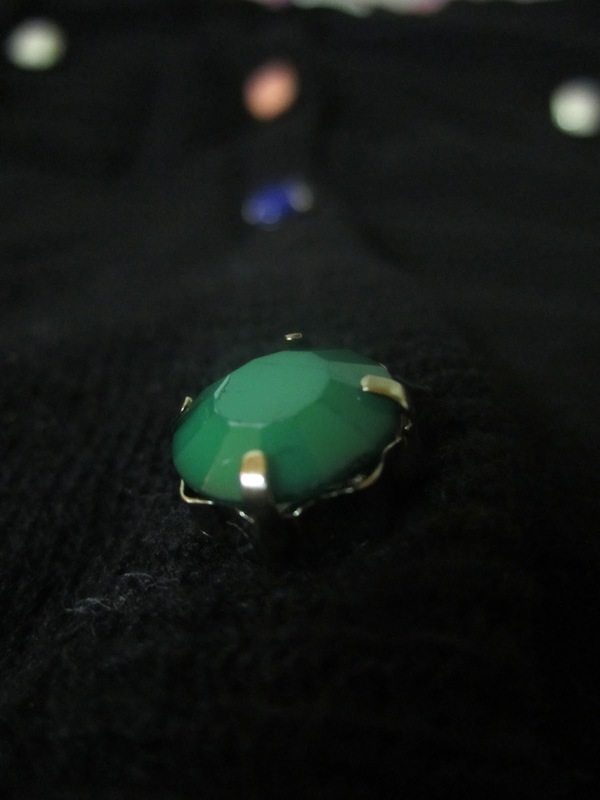 She said she thought of me, and I should wear it. I was so touched! 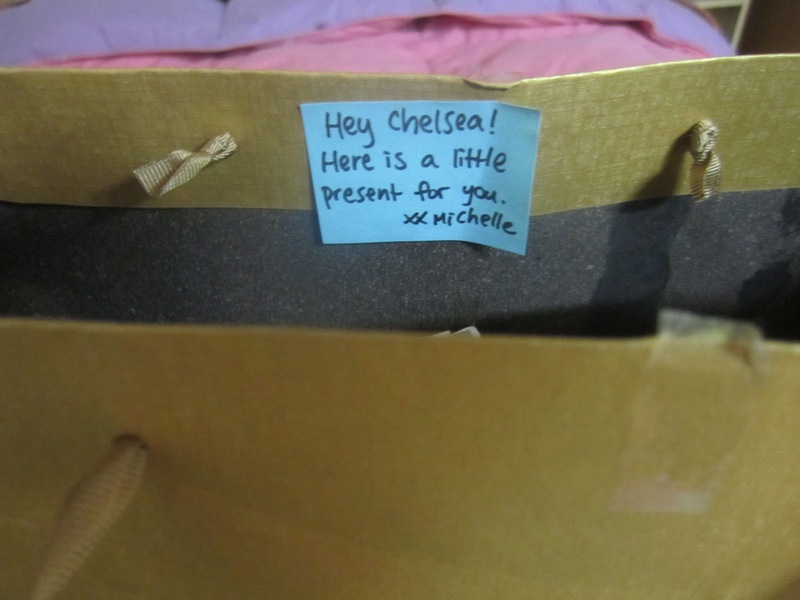 She gave me a giftbag at work, and when I cut the tape to open it, I got a little surprise note. So adorable! 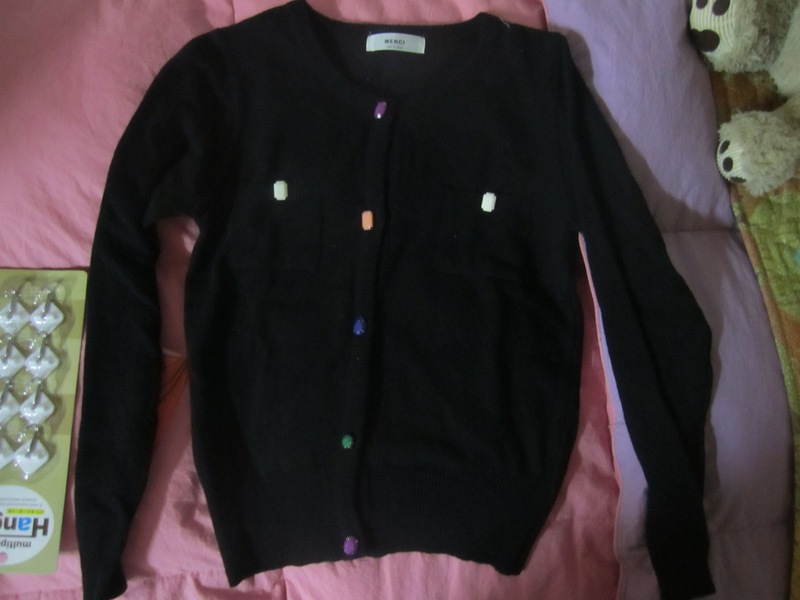 The sweater is adorable, with cute colored jewels as buttons. How cute is this?! "Made in Korea"
The buttons on the sweater! I don't know what you're talking about, this wasn't a boring blog at all! :) I love to hear all about you! And, hurrah for pay checks going through!! Ditto!! Abby & I want to hear EVERY thing!! Get it? Like, everything... YAY, you've officially been paid and you have money in the bank! Your room is so CUTE. I'm thinking everyone should have one just about that size! Yeah, easier to mess up, but pretty fast clean-up. So sorry about your "funk" - just think, it's FUN, but with a 'k'. You can choose to delete that! (easy for me to say?) LOVE your nail polish; LOVE the sweet gift from Michelle - what a terrific friend you have!! OK, to reaffirm, Abby & I are "on the same page" - haha - we love your blog. I bet there are many others who do as well, but Life Happens and Time Passes. (major growl) Love you! Love Your Fantastic Blog!!! Anon in LBK. Wow. I am way behind as my iPad is wifi and none at work. Then at work my computer won't let me read blog site...gotta love the Air Force. So I'm limited. I'm back to school so not a lot of free reading time. I can't believe my mom called me out. Thanks mom... I will try to comment more just know its old news by then. I love reading you blogs. Sharing your life is not boring to us. Love ya. I share often at work and in my class about life in Korea. My class is diversity.